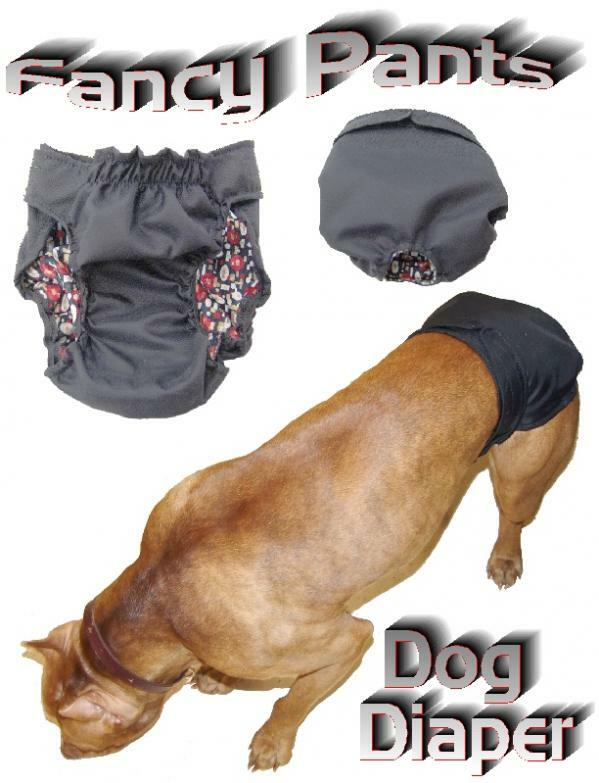 Select a Size: XSmall 10"-12" Small 12"-15" Medium 15"-19" Large 19"-25" XLarge 25"-30"
These dog diapers aka “Fancy Pants” are a solution to your female dog spotting problem while she is in heat. I recently had two females in heat at the same time. Most of my dogs are indoors at night so I purchased a dog diaper. It was soft flannel on the interior and soft cotton on the exterior and I put a pad on the inside of it. The problem was that there was not enough protection and by morning the mess had come through the diaper. Not to mention she wanted to lick so getting it wet from the exterior was another problem that did not help matters. After a few days of this I set out to invent a better solution and our “Fancy Pants” are the problem solver. 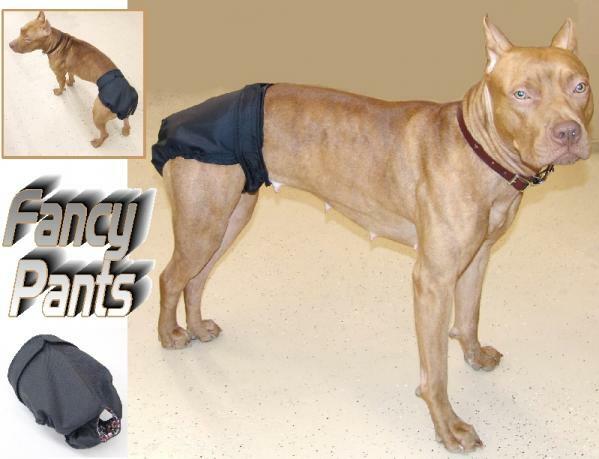 These are also handy pants for those older dogs that may be having problems holding their bladder. 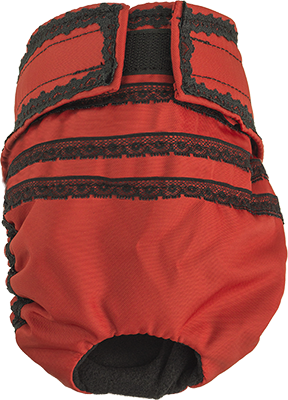 Our Fancy Pants are made of soft water repellant exterior and a soft fabric interior. In the bottom area we have sandwiched washable padding between the layers of fabric. 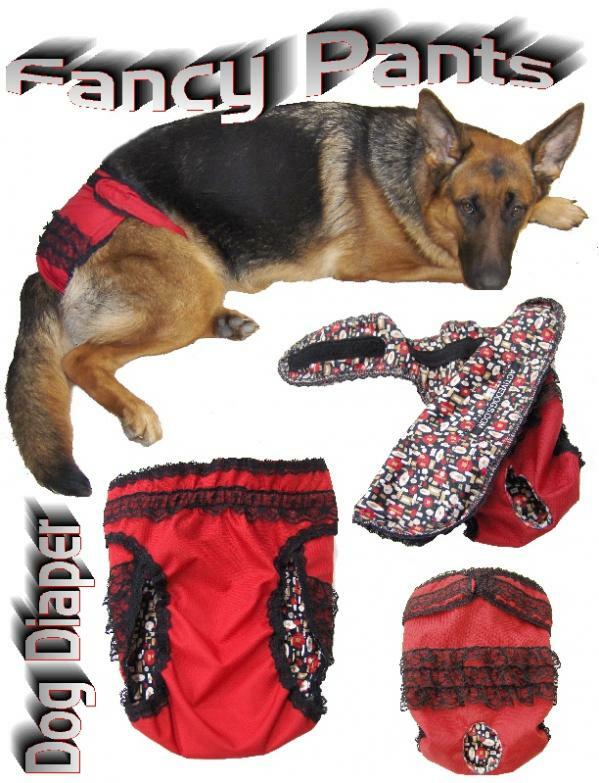 No need to add a pad to these diapers as the pad is already built into them. The legs and flank area have elastic so they fit snuggly and stay on. And do they stay on, yes indeed; one of my young females jumped out of my low window and squatted in the yard did her business and ran back over to me with diaper and the contents all in tact. As long as my girl had to wear these I thought why not be fancy so that is where all the lace came into the picture. Now if you have a conservative girl we also have just plain black no lace “Fancy Pants”. They are made just the same as the red pants, less the lace. These are machine washable and machine dryable and they wash up beautifully. Choose from 5 sizes and two colors. 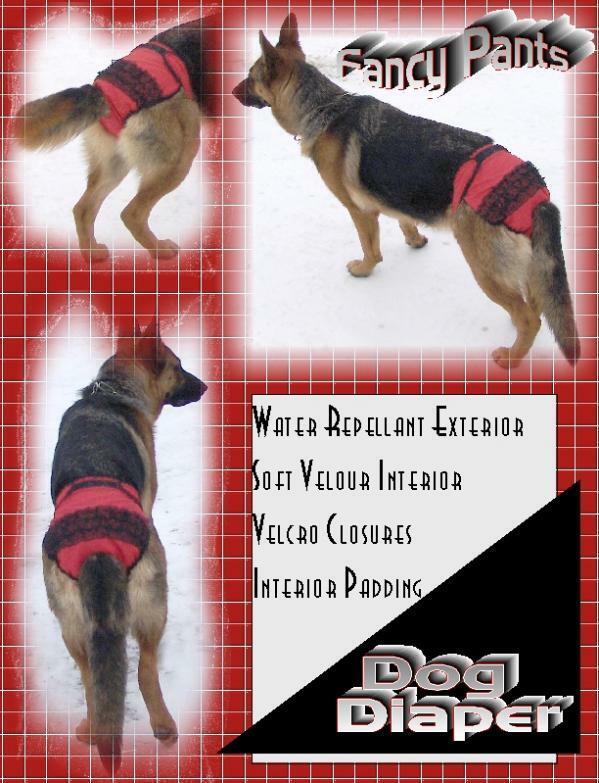 See the Measurement page to insure you order the correct size for your dog. Also sold in sets of three at discounted price.